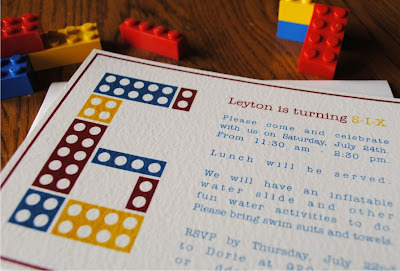 Whew...We just got done with Maddie's party and here I am on to planning Leyton's. When asked what sort of party he'd like it was hands down a LEGO one. The kid loves LEGOS right now so, LEGOS it is. 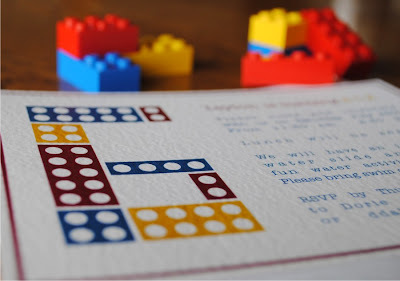 I searched the web a bit and really liked these simple party ideas here so this was a bit of an inspiration. I love the paper LEGO's hanging from the ceiling and that is already on my list. 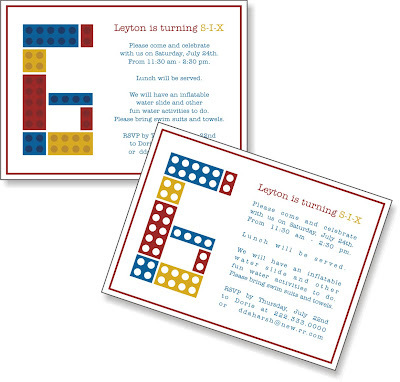 Here are the invitations I designed for Leyton's 6th birthday party. He is completely excited for this. I am too! I have some great ideas and once again cannot wait to share another birthday party with you. The Big Guy and I went as Legos one year for halloween. We won best couple costume! It was super easy, just cut out circles on the front and back of a suitable sized box. Glue in deli cups, (facing in on the back, out on the front) and spray paint a box yellow or blue. Plus we interlocked- It was awesome!